Bringing your voice to life. The University blogging service is created using a multisite WordPress installation. The service is available to anyone within the University who needs to create a blog for academic or research needs. 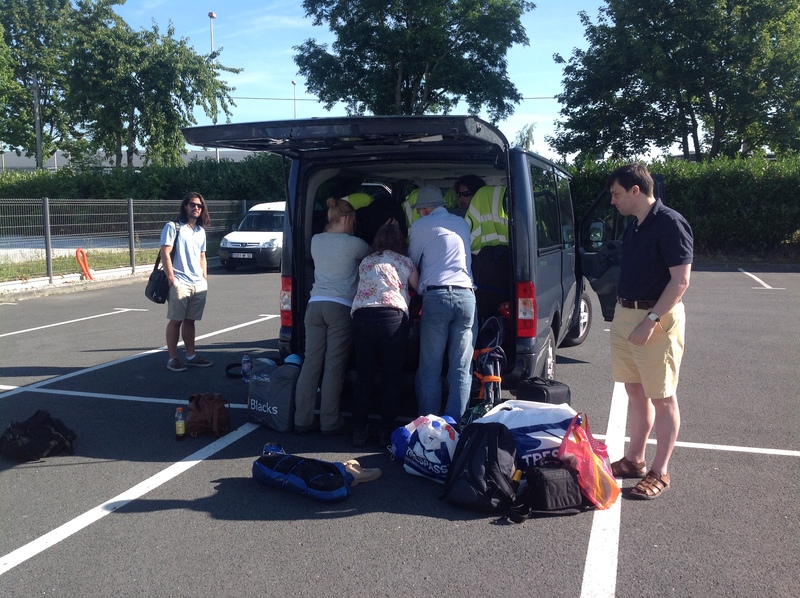 This year’s CAHO Palaeolithic field trip to France, with the Captain William S. Davies (CAHO’s new director!!) at the helm. Today was our first full day in France. We caught the boat from Portsmouth yesterday for a mid-afternoon sailing and were in Caen by late evening. An early start (ish) saw us on the road heading southwards for north central France. You get a real sense of how flat the loess plain is between the coast and Paris as you drive, and of course beneath the fields and trees are a wealth of Late Middle Pleistocene sites waiting to be discovered. Before we started I was privileged to see a minor miracle in the art – no the science – of putting a large volume of kit into an astonishingly small space as Jo, Sarah and Cathy decided they would take charge of the packing. With nine people and all their gear, this is one thing you have to get right. They did, and we were away. There were two sites on the afternoon’s agenda. The first was the museum at Grand Pressigny. Wow – a museum dedicated to flint, does it get any better? – well its Neolithic, but you can’t have everything. I’d never seen the famous Livres de Beurre as these big honey coloured cores are called. They are knapped by a PCT for the purpose of making between five and ten long blades. 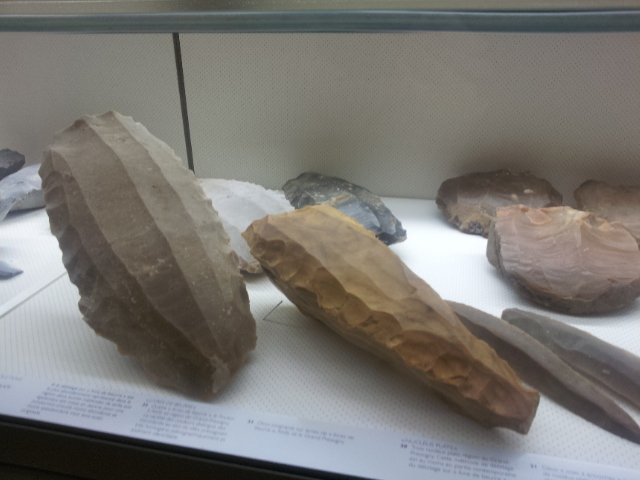 They were knapped by masters of their craft and then traded out of the region, possibly by the makers themselves. It seemed ownership of such a blade, or a knife made from one, may have conferred much prestige on its owner. They are dated to between 2009 and 2003 BC. Like so many French museums this one is a thoughtful blend of detailed information (no dumbing down here) and elegant presentation. This was my first time here, and the museum has not been long open. If you are ever in the area it’s well worth the detour. Livres de Beurre at Grand Pressigny. From there it was a short drive to the Roc-aux-Sorciers, another newish museum and another one where presentation and design have been carefully and successfully blended. Here a long freeze of horses, bison, wild goats and other animals was discovered in the 1950s and investigated by Suzanne de Saint-Mathurin and Dorothy Garrod. A modern projection onto a replica of the original rock shelter surface gives a marvellous impression of the contoured surface of the original, and how the artists used the contours to convey movement within the animal freeze. Being a Lower Palaeolithic man myself I claim no knowledge of this kind of late Magdelenian art, but I was amazed by the two human faces on the freeze, and the stylistically similar ones at la Marche 30-40 km away. There, our guide told us, they have complete figures (and the Roc-aux-Sorciers has copies of them). There is something rather unsettling about looking at a face from 15,000 years ago. The reconstruction and visual show are effective and very atmospheric. The evening was spent staying with friends of William, Chris and John Lees who lived nearby. We will long remember their kindness and hospitality. Tomorrow we penetrate even further south to fabled Les Eyzies. More from there later. Mac, William, Paul, Jo, Cathy, Sarah, Adam, Tanner and Christian.